Throughout the longest time of me writing for Hot In Social Media, I do not remember talking much about LinkedIn. As a matter of fact, I used to believe that LinkedIn is one of the worst social media platforms I have ever experience. But that thought was two years ago. And fast forward until today, I have a very much different opinion now. LinkedIn is a very powerful tool and if done right, you can easily land a nice job there! Plus, you can also use LinkedIn to reach out to new audiences. In this post, let’s discover some hidden possibilities using LinkedIn, shall we? You should be using LinkedIn to find the right target audience for your business. 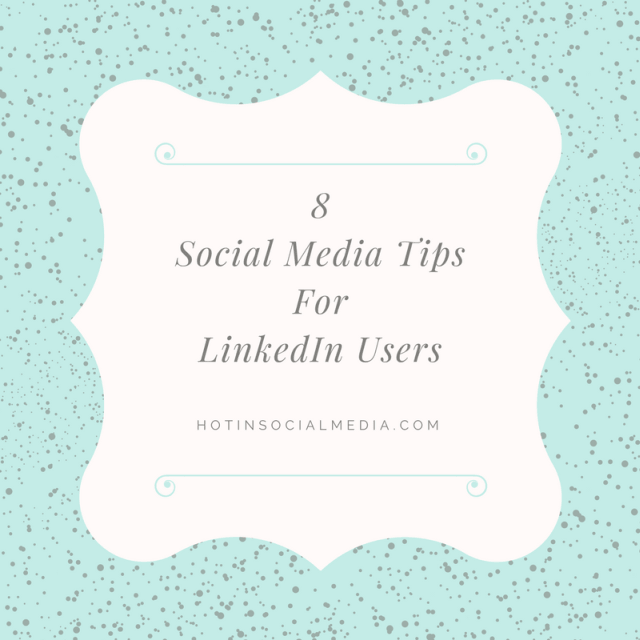 With LinkedIn connections, it becomes much earlier and you can easily do so by connecting to at least one user on LinkedIn. LinkedIn allows to zero into a very specific industry and therefore, it is always very effective to grow your business and sales effectively. Being on the radar is vital and in today’s world, it is definitely a challenge. With LinkedIn, you can easily connect (refer to point #1) and even share knowledge based on specific industry. This will ensure that you are constantly engaging and communicate with your highly, targeted audience. Simply because you have the ability to connect with them on LinkedIn, you will be able to listen to the challenge faced by them. Next, you can be the solution provider and in a long run, it will be very profitable for you and your organization. Most people do not understand the power of LinkedIn sponsored updates. With this feature, businesses can pay to display their post into various individual’s LinkedIn feed. With some tweaks, you can easily define the demographic behaviors such as location, gender and age which will further boost your reach. A huge plus point is because LinkedIn is a very business orientated social media platform. Therefore, it is powerful enough for you to reach to your most preferred audience. With sponsored updates, you can also choose pay per click or the pay per 1,000 impression option. One of the most common usages for this feature is when an organization promoting a piece of their content, whitepaper or report. Do you know that you have the ability to create a powerful tagline for your profile? The answer is “yes” if you are still wondering. While there is no exact method on what you should write in the tagline, trying to make it as catchy as possible is always recommended. After all, you should remember that you are competing with thousands of others who uses buzz words such as “specialist”, “consultant” and “best”. At the end of the day, you want to create a good LinkedIn profile which is effective and catching to the eyes. You should always aim for taglines that are unique which can resonate well with your potential clients. Do you know that you should always encourage your associate to participate in LinkedIn? When they join, encourage them to add their working experience and working location. Indirectly, the above will boost the visibility for your business in a long run. Want to make the entire process more fun? Leave a positive comment or recommendations on LinkedIn for your associates. Trust me, they would be happier than ever to receive it! Who knows, they might just return the favor to you as well! Seriously, this is a no-brainer. LinkedIn groups are the best way if you want to engage with your potential customers. You can also mix with those like-minded like yours and share ideas is just one of them. Joining a LinkedIn group is always easy, staying active (and alive) is always the toughest part. Most people does it wrongly when they join a group; they promote the hell out of themselves or their product. Instead of doing that (and losing credibility), you should be proactive and create communication with the group members. It can simply be sharing ideas and knowledge as well as sharing possible solutions to their problems. Of course, you are free to promote your products but ensure that you are only doing it once awhile. 7. Did you forget about your LinkedIn company page? You should always create a company page, regardless the size of your business. A company page represents your brand and the easiest way is to keep the page updated from time to time. Always remember that the imagery, content and color that you use on the LinkedIn company page is similar to your brand for easier recognition. At the same time, your LinkedIn company page should also be active and therefore, you need to constantly share information on it. An inactive LinkedIn company page is utterly useless and should be avoided at all cost. Lastly, you should always claim your custom URL on LinkedIn especially when you have the chance (and if the name is available). This is just one part of branding and believes it or not, most people rather head over to LinkedIn especially for business related than just your official website (unless they are dead serious and knows exactly what you offer). Apart from that, a custom LinkedIn URL will also project professionalism and it goes a long way especially when you are offering professional services. A custom LinkedIn URL will also more likely place you at the top of the search and being above the ‘noisy crowd’. As for the summary, always remember that LinkedIn (or social media marketing) is always the numbers game. You need to constantly create powerful content and build connection across various social media platforms if you want to be successful. With LinkedIn being the top platform for professionals, it is just an absolutely waste if you are not leveraging it properly. LinkedIn has many advantages under its sleeves and you should never underestimate the power of it.